While the number of cattle across the country has dropped in recent years, the numbers in La Plata County and Montezuma County are relatively stable since 2007. Drought in California and Texas is cited as one reason for declining herds across the country. 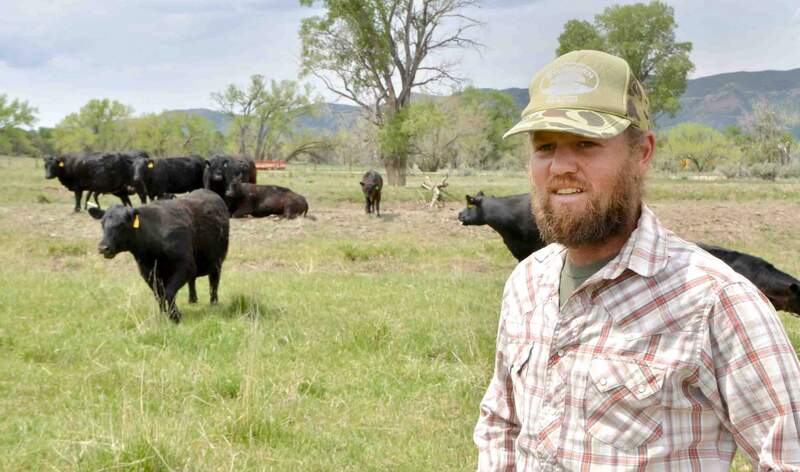 Among other duties, Dustin Stein takes care of the at cattle Stubborn Farms in Mancos. While the number of beef cattle has declined nationally, local beef cattle herds remained more stable in recent years, according to U.S. agriculture data released in May. Montezuma County cattlemen reported a small reduction of cattle designated for meat production from 12,850 in 2007 to 12,660 in 2012. In La Plata County, ranchers saw no decrease from 13,316 beef cows in 2007 to 13,300 in 2012. Dolores County did not provide data. Across Colorado, the number of beef cattle dropped by about 51,000, to 683,291 in 2012. This decline in herds has also occurred nationally. In January, there were 29 million beef cattle across the country, according to the U.S. Department of Agriculture Annual Cattle Inventory Report. In January 2012, there were 29.9 million. Several factors have contributed to the decline across the nation that are now driving prices higher for local calves and retail beef. Before 2007, herds nationally were in decline because the price of calves was low, causing many ranchers to reduce their herds, said Bob Bragg, a local farm and ranch consultant. The high price of grain drove farmers and ranchers to plow land dedicated to grazing, he said. Droughts in Colorado, California, Texas and other states caused a reduction in inventory. Drought or another factor persuaded many aging cattlemen to sell or downsize their herds, and they weren’t inclined to build their herds back up when calf prices started to turn around, Bragg said. “They are looking at retirement, rather than spending several years building back their herds,” he said. The retail price of beef has reached record highs, and the retail price for all types of beef cuts rose to a new peak April. For example, the average price of ground beef rose by about 10 cents from the March price to $3.80 per pound, and the average price of USDA choice steak rose by about 30 cents since March, to $7.35 per pound. The decreasing inventory of cattle is often cited for the rise in the retail price of beef over the past five or six years, Bragg said. Feedlots are also driving up prices. They are now able to pay more for feeder cattle because the price of corn has come down, said Terry Frankhauser, executive vice president of the Colorado Cattlemen’s Association. The annual average price of corn has trended down since 2012, when it was $6.89 a bushel. In 2013, the average was $4.65. This has allowed feedlots to come back to making profits after being in the red, Frankhauser said. One longtime Mancos rancher, Larry Everett, said he is wary of high prices because they are part of a cycle he has seen play out several times. As the prices rise, cattlemen are likely to hold back heifers to build their herds, and the price of beef will continue to rise for two or three years, as inventory contracts. But once the herds are rebuilt, a wave of calves come to market, forcing the price down and leading ranchers to sell out. “The cattle industry has experienced this numerous times,” he said. It is possible drought conditions could slow the national cycle. “The Western drought is making cattlemen reluctant to hold back heifers when they don’t know whether they will have feed to even maintain the cows they now have,” he said. Bragg said prices may start to drop in 2017 or 2018.